Crankshaft "Happy Birthday" Music Box, Party Blowers. Vanilla Sprinkle Cookies, Party Cake Bites, Lindt Truffles. Gummy Peach Rings, Champagne Gummy Bears and more. Worried about shipping? Rest assured, these gourmet items are shipped with food-safe gel ice packs, safeguarding the condition during the shipping process. Birthday Bliss Gourmet Gift Tower is a hand delivered gift. These gifts are delivered by one of our local design centers located throughout the United States and Canada. Same day delivery is available for most gifts when ordered before the cutoff time. The cutoff time for Birthday Bliss Gourmet Gift Tower is 1 PM in the recipient's time zone. Candy Raspberries and BlackberriesRed and black candies that look like real raspberries and taste even sweeter. A crunchy candy coating gives way to a tangy, silky center. Happy Birthday Music BoxThe original crankshaft music box! Enjoy and share the magical notes by placing the instrument on a hard surface and turn the crank to hear the Happy Birthday song. 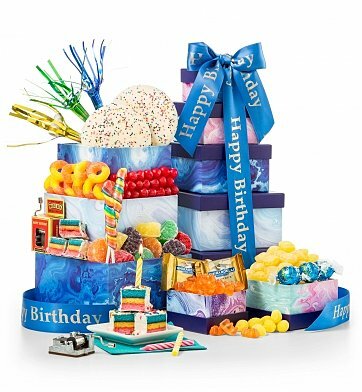 Transform a birthday into a super celebration with this vibrant gift tower! Happy Birthday Music Box, Party Blowers and Birthday Cake Bites. Lindor White Chocolate Truffles, Vanilla Sprinkle Cookies and more. My daughter was amazed and really enjoyed the variety of delicious candies, and birthday areas inside. Thank you and will order again. I've never sent a gift like this before...my 5 year old niece called me squealing in delight! She described it as"the most beautiful thing she has ever seen!" Thank you so much for your choices!